March has been a strange month so far for Kansas City. Tornadoes, sunny 70-degree days, and snow in the same week. So when Shamrock FC rolled in for SFC 285, one would almost expect an unusual night even with the innocuous fight card. The main event was a great match for the spectators because of the contrasting styles, and Garrett Mueller's granite chin, and Steven Nguyen's creative offense. Mueller came out pressuring with constant strikes, forward motion, and seemingly the ability to shake off Nguyen's best puncbes. Nguyen by comparison hung back, remained poised, and looked to counter punch and counter attack everything Mueller threw. Three times Nguyen was able to catch a leg kick by Mueller leading to a trip take down. Nguyen controlled the tempo and where the fight moved in the ring. Both fighters were able to land heavy strikes during all three rounds but neither could finish the other. When the scorecards were tallied, Nguyen earned a unanimous decision victory and improves to 3-0. Jesse Finney now has a problem, who gets to fight for the Shamrock FC featherweight title? With Nguyen improving to 3-0, undefeated Rashard Lovelace will be returning to action soon, and plenty of new signings, there is no shortage of contenders. Bantamweights Billy Benz and Keeton Gorton started off with Benz pushing a frenetic pace with head movement and constant forward motion. Benz kept up the pressure throughout the first round of this co-main event match-up, but Gorton hung in there and weathered the attack well. By the second round Benz looked winded and seemed like he couldn't keep up the same pace. Gorton controlled the ring most of the second until a late rally by Benz lead to a takedown. With Gorton on his back, he slapped on a triangle with just twenty seconds left in the round, and with only 4 seconds left in the round, Benz tapped out. The win improved Gorton to 4-3, with a much needed victory to take him above .500. It didn't take Calen Born long to get his professional career started off right. Born put away Garett Nilges with a TKO at 32 seconds of the first round. The two middleweights traded early and often with Born connecting with a big over hand right that sent Nilges to the floor, and from there it was academic. Born a natural welterweight lost his opponent earlier in the week in a proposed catch-weight of 180. Look for Born back this summer at his natural weight of 170. Steven Graham breaks his three fight loss streak with a win over Jordan Hernandez. The first round guillotine choke victory improves the Jason Bircher purple belt to 2-3. In the evening's featured amateur bout, Caveman Crew's Cesar Morales, down in points due to points taken due to low blows, was able to come from behind with an impressive TKO, slamming his opponent out of a triangle. Heavyweights Tommy Thurber and Andrew Floyd tangled in a match-up loaded with heavy artillery. It was Floyd's kicks that seemed to make the difference, and with Thurber's back against the cage, Floyd was able to send him to the canvas to score a first round TKO. In an exhibition grappling match, Jacob Akin scored a flying triangle only seconds into the match-up with Codi Peppard to take home the victory. Peppard went completely out, refusing to tap. Anthony Goldfield made short work of late-replacement Jake Willyard scoring a first round TKO and announcing his pro debut in the post-fight interview. 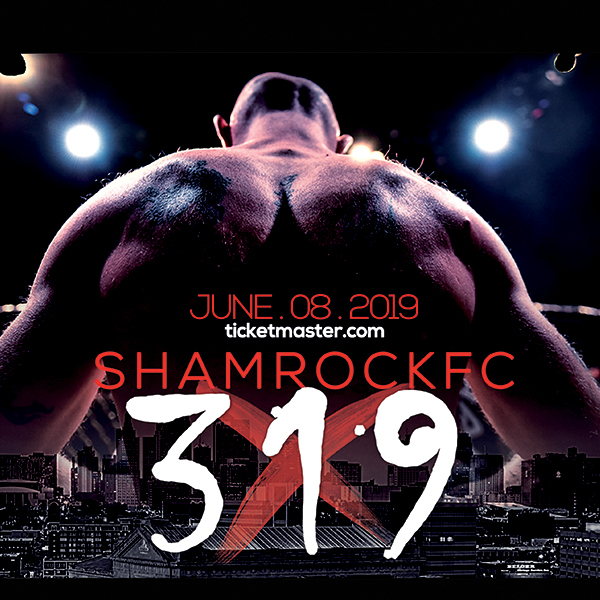 It was a first for Shamrock FC and incredible to see live, in the closing seconds of the first round, Alan Vasquez and Axel Cazares both connected simultaneously sending both fighters to their back. As per rule, the first fighter to stand up wins. So in Rocky-esk fashion, the ref hovered over the two downed opponents waiting to declare a winner until Vasquez stood up. And even though Vasquez will be smelling out of his right ear for a while due to a nasty broken nose, he earned the KO victory. The night began with a great prelim fight that went the distance highlighting the skill of both, but in the end it was Fenando Andrade who took home the decision. 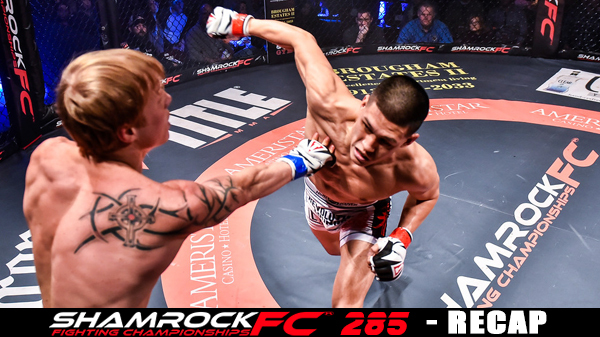 Shamrock FC returns to the Ameristar Casino May 20th with a marquee fight between Bobby Voelker and Zak Bucia for Shamrock FC 289, and they will crown their first Welterweight champ.